SEATTLE – The series of events that led to Darren Gardenhire’s eventual arrival at the University of Washington began, in a domino-effect kind of way, with USC. If the Trojans hadn’t fired coach Lane Kiffin midway through the 2013 season, they wouldn’t have needed to replace him. And if they hadn’t decided to replace him with former Huskies coach Steve Sarkisian, then UW wouldn’t have needed to replace Sarkisian with Chris Petersen, who had spent the previous eight seasons as head coach at Boise State. What does any of that have to do with Gardenhire, now a sophomore cornerback for the Huskies who could make his first career start when UW begins the season Sept. 4 at Boise State? Gardenhire says he always liked UW, and that as a young high-schooler from Long Beach, California, he visited the UW campus – Huskies tailback Dwayne Washington is his cousin, and he knew some other players, too – and came away wowed by how ”different” it looked. But Sarkisian and his staff hadn’t shown much interest in the three-star defensive back. Petersen, however, liked him plenty, and Boise State was one of the first schools to offer him a scholarship. Gardenhire, though, had offers from two other Pac-12 schools – Washington State and Utah – and eventually committed to the Cougars on Nov. 24, 2013, nine days before Sarkisian left UW for USC, and 12 days before Petersen agreed to leave Boise State for UW. That could not have been better news for Gardenhire. He liked Petersen and his staff, but said he didn’t think the scholarship numbers at Boise State would work in his favor. If Petersen still wanted him at UW, though? UW defensive backs coach Jimmy Lake (North Central, EWU) said Gardenhire was one of his top recruiting priorities upon accompanying Petersen to Washington – “we loved his length, loved his competitiveness,” Lake said – and it didn’t take much urging to get him on board. Gardenhire decommitted from WSU the day the Huskies offered him a scholarship. 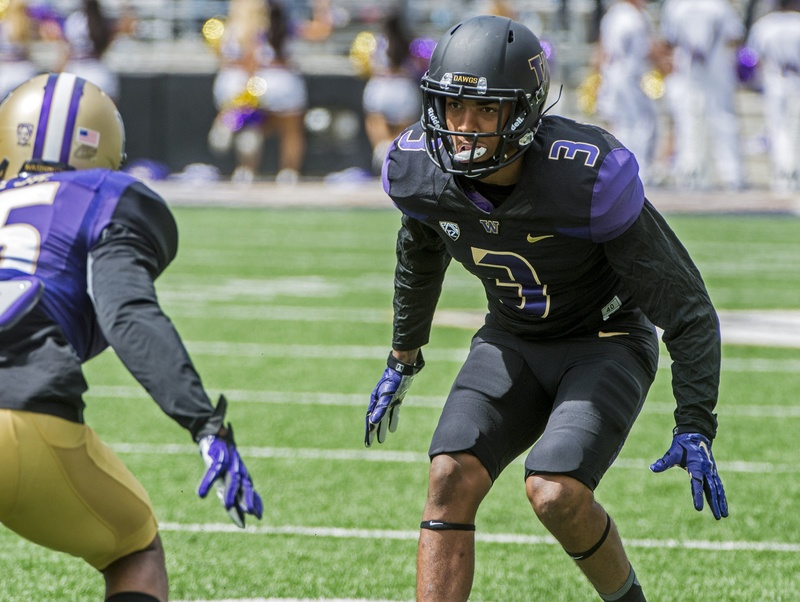 With their secondary thinned by graduation, Gardenhire became one of four true freshman defensive backs to play for the Huskies in 2014, though he mostly contributed on special teams and rarely saw the field as a defensive player. After a senior season at Cabrillo High School in which he played receiver, safety and returned kicks and punts, adjusting to the college game as a cornerback wasn’t easy. The extra effort seems to have paid off. Gardenhire has been a fixture since spring at the starting cornerback spot opposite fellow sophomore Sidney Jones. That duo has taken nearly all of the first-team repetitions throughout training camp, too. Lake praises Gardenhire’s ball skills, which were on display when the 5-foot-11, 185-pound corner intercepted a pass and returned it 100 yards for a touchdown during UW’s “spring preview” in April. He’s snagged a handful of interceptions in camp, too. So after a freshman season in which he admits “I didn’t really know what I was doing,” Gardenhire suddenly has the opportunity to be a Day 1 starter as a sophomore.